James Toseland got his World Superbike season off to a flying start with a win and a second place in Qatar. 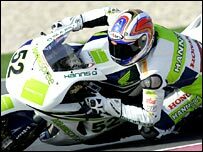 Britain's 2004 champion was runner-up to Italian Max Biaggi in the opening race at the Losail circuit near Doha. The Ten Kate Honda rider then took victory in the second ahead of Suzuki's Biaggi and Australia's former world champion Troy Corser on a Yamaha. Ducati's reigning champion Troy Bayliss had to settle for fifth in the opener and seventh in the second race. Toseland had looked in with a good chance of winning race one with his Honda the fastest bike on the straights. He led for two thirds of the race before Biaggi made the most of his better cornering speed in the closing laps. Race two looked to be following a similar pattern when Biaggi wore down the faster starting Corser and his Japanese team-mate Haga and had Toseland in his sights. Despite problems with worn tyres on the last couple of laps Toseland had been able to build up a big enough gap to hold off his challenger. Corser won the battle with Haga for the final podium spot. Sheffield-born Toseland said: "I went a bit too hard too early in race one and I was able to conserve the tyres a bit more in race two. "But I'm joint leader in the championship and I just hope to stay there now." The series moves to Australia's Phillip Island circuit next weekend, and Toseland added: "I had two podiums there last year and it was one of our best tracks." 606 DEBATE: How will James Toseland fare this season?